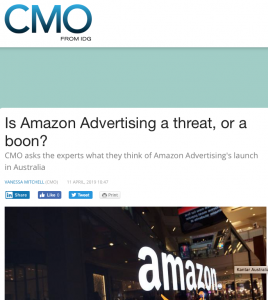 Kantar Australia | CMO: Is Amazon Advertising a threat, or a boon? “Amazon’s ability to link advertising and sales almost immediately gives it a point of difference in the local market other players just don’t have. “It’s inevitable these services will launch here; Amazon is progressively rolling out its suite of solutions globally, so it’s not surprising. It is interesting, however, in terms of where Amazon is at in the cycle and how quickly things roll out,” he commented.